Gantry cranes, also called portal cranes, are one of the most versatile lifting mechanisms, having almost limitless applications for material handling challenges. The type of gantry you may need is largely dependent on the application of the crane in your workspace. As there are many different categories of gantries, we will talk about the main types, what they are used for, and defining features. 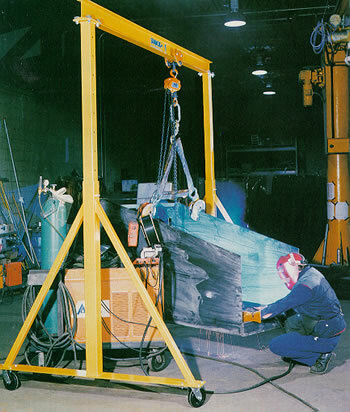 Adjustable: The tradeoff of the adjustable gantry crane is flexibility in height for a higher maximum carrying capacity. The height range is usually somewhere between an 8-foot minimum height, and a 14-foot maximum height. In general, these cranes have a maximum lifting capacity of 2 tons, although there is variety from manufacturer to manufacturer. Bridge Crane: The advantage of bridge cranes comes from their ability to save space in the workplace. Having the option to be freestanding, or ceiling-mounted, is also a nice option. The “runways” or “rails” of this type of crane is the defining feature, allowing for easy horizontal movement of the load. Fixed: When looking to carry extremely heavy loads, fixed gantry cranes are the way to go. They offer the highest carrying weight then compared to other types of cranes. Also these cranes are the most durable. Go for a fixed crane if you will be carrying heavy loads and/or will not be moving to a different facility any time soon. Portable: Portable gantry cranes are typically used in an environment when a lot of versatility is needed. Portable gantries really show their strength when a product is needed to be moved from inside to outside of a building, or vice versa. These cranes are very cost effective, particularly when you compare to the cost of getting a fixed crane installed, and then moved to a new facility. You can read our review of gantry cranes to compare several affordable options. Load Capacity: This is the maximum weight that the crane can carry. Some cranes can only handle 300lbs, while some heavier duty cranes can handle up to 8 tons. Be careful to check the weight rating of the gantry crane before you buy it, as exceeding the maximum load capacity can be extremely dangerous. I Beam Flange Width: Be careful to not mistake this metric for the width of the entire gantry. Instead, this measurement is the width of the I beam that sits atop the crane. It is wise to check and make sure that the accessories you use with the crane, such as trolleys and festoon hangers, are compatible with the width of the I beam flange. Another consideration is that in general, the wider the I beam, the higher the load capacity. Maximum and minimum I beam height: This measurement only applies to adjustable gantry cranes. Most cranes have a range from 8-foot to 14-foot, although many manufacturers make custom cranes with higher or lower heights. Span: The span of the gantry is the total width of the unit. In general, most cranes come in the 8-foot to 15-foot range. Material: There are two main options when it comes to gantry crane material: aluminum, and steel. Aluminum cranes will tend to be lighter weight, have lower load capacities, and be more cost efficient. Steel cranes, on the other hand, are heavier, have higher load capacities, and are more expensive. The type of material you will need for your crane will depend on the application of the crane. One word of caution: not all steel cranes will have higher load capacities than all aluminum cranes. Be sure to check the specs of the gantry before you purchase. Reputable manufacturer: Some manufacturers make better products than others. It may be smart to see if the manufacturer of the crane has a good reputation before you purchase from them. Often a manufacturer that has a good reputation will make a superior product, have better customer service, and have more favorable return policies than others. Customer reviews: Checking up on product reviews is one way to make sure that the product you are buying is quality. It is not worth buying an inexpensive crane that has bad reviews, just to save a few dollars. This will usually hurt you in the long run, as you will most likely have to buy a better gantry down the road. Return policy: There are a lot of options when it comes to buying a gantry crane, and the crane you end up with may not be exactly what you need or want. Having a flexible return policy can save you a lot of money and take some of the stress out of the buying decision. Product support: Making sure there is good product support around the item you are purchasing will save you a lot of headache down the road. Although gantries may seem simple, it is possible for pieces to break or not function properly. Check to see if the manufacturer offers product support, or check online to see if there are videos or forums about the item you are thinking of buying.